So it has been almost a month since I have posted and unfortunately it isn’t because we have been off enjoying a holiday in France. Instead we are nursing our poor Max who broke his leg in two places and displaced a growth plate in his ankle. One operation later to put pins into his ankle to hold everything in place and he is recovering at home and getting completely spoilt rotten. It was one of those total freak accidents that could have happened anytime, anywhere and it is still hard to believe it happened at all. 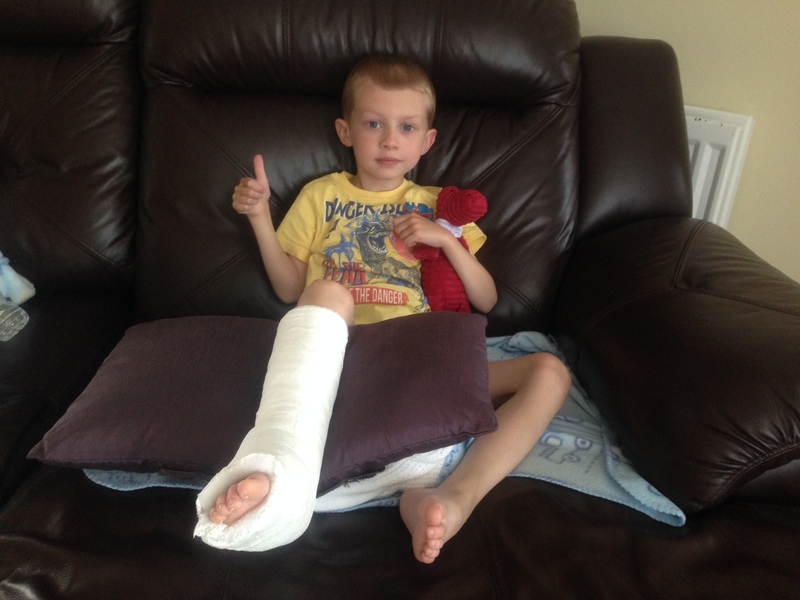 He was playing football in the garden with his aunty when they both fell over – something they do all the time – but this time his leg must have somehow got twisted. My poor sister felt so bad about it all but I finally convinced her (as much as she would let me!) that she was absolutely not to blame in any way and it was just a crazy accident. As we were at my parents’ house my dad raced us straight to our local A&E which thankfully is only a 15 minute car journey away, though felt like hours. Despite an incredibly busy evening Max was taken immediately, given wonderful pain relief, x-rayed and put into a thigh high plaster cast. We were then ambulanced to a hospital in Belfast where they have a paediatric orthopaedic team who performed the surgery on him the following day. He is now in a shorter cast that reaches his knee so thankfully has more movement in his leg and his pain is mostly under control. The cast will be on for six weeks and he is not allowed to weight bear for any of this time. No doubt it will be a few weeks after that until he gains his confidence when he gets back on his feet. The doctors and nurses who treated Max were all absolutely amazing and it made me very thankful once again for the wonderful NHS system that we are privileged to have. So the summer holidays have been altered slightly to include a lot of chair based activities – colouring, painting, lego, stories, films – and hopefully we’ll be able to get him out to the cinema a few times as well. He has been so unbelievably brave through it all and we are so proud of him. It has felt a bit like Christmas in our house since it happened with all the lovely presents and cards he has received so if you are looking for a silver lining I think that would be it for a six year old! It will also be a good story for him to tell when he is all healed up – though definitely one I want to forget and never experience again!